Nursing home abuse causes severe injury and even death to thousands of residents in Minnesota every year. Nursing home abuse and neglect must be put to an end if society wishes to move forward in treating elderly citizens with the respect and care that they deserve. Statistics from a University of California-San Francisco research study indicate that over 46 percent of individuals in nursing homes developed bed sores at some point in 2008. Medicare routinely surveys, inspects and investigates formally filed complaints on every Minnesota nursing facility at least one time every year. 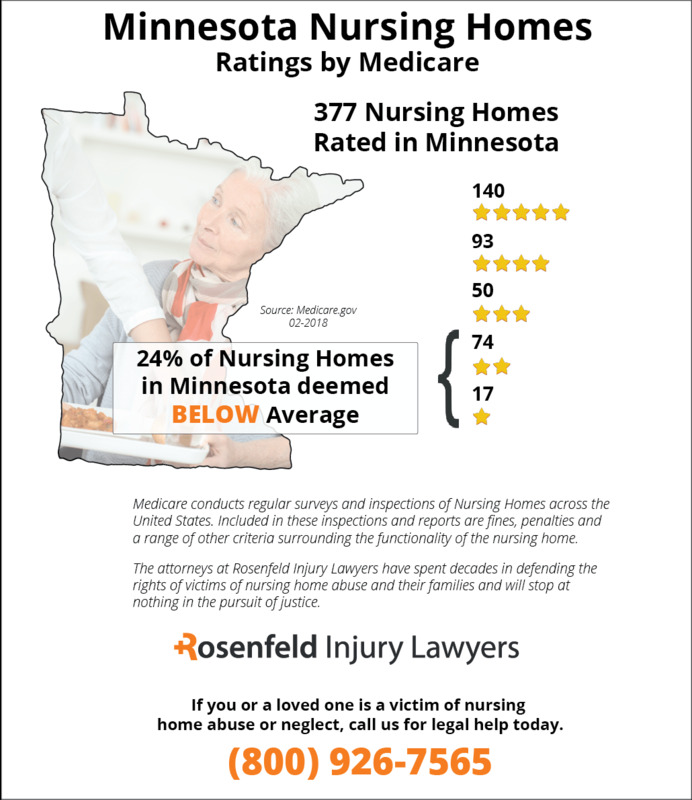 According to the federal agency, currently, ninety-one (24%) of the 377 nursing homes rated in Minnesota have fallen below the national average because they provide substandard care to their residents that led to injury or wrongful death. If your loved one was injured, mistreated, abused or died prematurely from neglect, we encourage you to contact the Minnesota nursing home abuse & neglect lawyers at Nursing Home Law Center today to discuss a compensation claim during a free case evaluation. 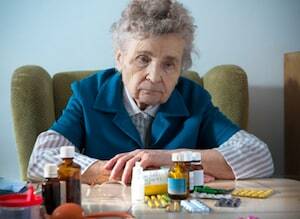 Even more disheartening, over 51 percent of residents were forced to consume unnecessary drugs in nursing homes in 2008. The only way in which nursing home neglect and abuse will be put to an end is if family members begin to demand better care for their loved ones. Family members must take every opportunity to report instances of abuse or neglect that they witness in a nursing home environment. 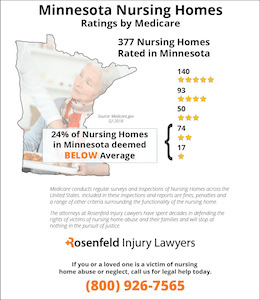 Nursing home abuse is a serious societal issue that has been addressed by several federal laws and numerous Minnesota nursing home laws. Under the federal law, the Nursing Home Reform Act of 1987 is the governing source of authority that puts forth the rights and protections that nursing home residents can expect to have in a nursing home. Nursing home residents have the right to receive full care and attention from staff workers in a nursing home. This means that nursing home administrators need to take extra care to ensure that it has adequate staffing levels. Staff members must provide constant care to residents not forget to provide them with meals or medication. Nursing home administrators are always looking for ways to reduce costs, and often residents are the ones who have to suffer as a result of budget cuts. If you feel that your loved one is being deprived of services that he or she has a right to receive, then you can get in touch with a Minnesota nursing home lawyer today. When you have a hunch that abuse or neglect is affecting a loved one, it is important for you to trust your gut feeling. You can call a nursing home lawyer today if you have suspicions that abuse is occurring in a nursing home, and a lawyer will begin to investigate the nursing home. A lawyer can research the past history of a nursing home and see whether the nursing home has engaged in abuse or neglect. It may be that the nursing home of your loved one has been cited in the past for inadequate staffing levels, the use of chemical or physical restraints and instances of neglect and abuse. You may be able to recover compensation for the harm that your loved one has suffered. Get in touch with a lawyer today to schedule an initial consultation and receive help for your case. Many patients in nursing homes across Minnesota are wheelchair-bound or bedridden and do not have the ability to reposition themselves or turn without help. Adjusting the body is crucial to minimize the potential of developing a bedsore, which is a serious medical condition that can progress to a deep, life-threatening wound. Unfortunately, pressure sores (bedsores; pressure ulcers; decubitus ulcers) are serious problems in nursing facilities and often the sign of neglect by the nursing staff. Nursing facilities in Minnesota have a legal duty to provide quality healthcare services to every resident in the home. They are required to follow regulated protocols to protect the health of all patients. Bedridden and wheelchair-bound patients must be repositioned at least one time within a two-hour time frame around-the-clock to ensure pressure is alleviated on the body that could cause a bedsore to form. When the blood is restricted by pressure, oxygen cannot reach the skin at the specific pressure points, causing the tissue to become damaged or die. When pressure compromises the tissue, it becomes reddened, tender or blistered. When initially detected in its early stage, the sore can be reversed quickly and heal within a few days or a week. However, in advancing stages, the condition can become significantly worse, where deep craters begin to form and bone, fat and muscle become exposed. Without antibiotics, advancing stage pressure sores can be devastating, increasing the potential of patient death. Stage I – In the initial stage, the sore is not an open wound and the skin feels slightly firm or soft to the touch when compared to surrounding tissue. Alleviating the pressure from the area is usually all that is required to heal the wound at this stage. Stage II – When the bedsore is allowed to progress to the second stage, a small crater, scrape or abrasion will likely develop. At this stage, the tissue is easily damaged and leaves a permanent scar or dies. Dead tissue requires debridement (cutting dead tissue away) to ensure successful healing. Stage III – All pressure sores advancing to the third stage can be indicators of neglect by health professionals improperly treating the wound, or avoiding treatment altogether. At this stage, the wound is a deep crater where fatty tissue is likely exposed. Stage IV – At the most advanced stage, the bedsore is now highly susceptible to infection of blood (sepsis) and/or bone (osteomyelitis). Typically, the permanent damage is extensive and only professionals who specialize in critical wounds should treat the shore to increase the potential of survival. When a loved one is suffering from an advanced pressure sore, it is crucial for family members and friends to take legal action. This is because progressive bedsores are typically the result of negligence or inattentiveness at the facility. If the patient’s skin had been monitored properly and any early-stage bedsore treated properly, the wound would likely not have progressed to an advanced critical stage. Fill the contact form here to schedule a no obligation free consultation with a reputable lawyer listed below. Through legal action, a Minnesota pressure sore attorney can stop the neglect immediately.